The seven day long Odisha MSME Trade Fair 2016 concluded on Thursday evening with reverberating success. Around 3.5 lacs visitors visited the seven day trade fair which witnessed a direct business of around Rs. 6 crores for the MSME exhibitors while simultaneously generating over business enquiries worth of over Rs. 70 crores. Governor S.C Jamir graced the ceremony and encouraged the entrepreneurs to come forward. “To ensure competitiveness of the MSMEs, it is essential that the availability of infrastructure, technology and skilled manpower are in tune with the global trends. Emphasis should be made on promoting the MSME products online. MSMEs play a major role in broad basing the industrial growth and augmenting employment opportunities, revenue exports and economic growth. 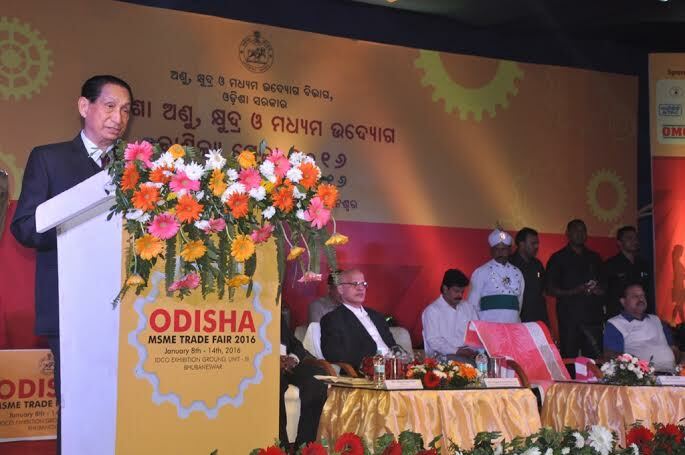 Odisha is endowed with vast agro, forest, mineral and other natural resources which can be effectively utilized for value addition and ultimately benefitting the State through economic growth and employment generation”, said Jamir. Jamir also stressed that 20 or 25% of the total procurement of any Government department or PSU is to be procured from MSMEs. MSMEs are the best vehicle for inclusive growth, to create local demand and consumption. The ceremony was also graced by Industries Minister Shri Devi Prasad Mishra who suggested increased focus on setting up of small industries to create employment opportunities. He put emphasis upon linkage conversion amongst the MSMEs and mother companies. MSME minister Jogendra Behera mentioned about the benefit of trade fair and how it has been instrumental in attracting new investors and youth entrepreneurs. MSME Principal Secretary Gagan Kumar Dhal accentuated the need to establish more agro based industries with more focus on food processing units with value added products. Director EPM B.K Das gave the vote of thanks to everyone for motivating the entrepreneurs and adding to creating future employment.